Being a region of high peaks, bitter winters and shorter summers than it’s Mediterranean neighbours of Provence, the Haute-Alpes may be assumed to be lacking in a wine region, and it’s cooking to be the usual glut of cheese and potatoes. Whilst these dishes do exist, the influence of its southerly neighbours can be witnessed in restaurants throughout the area. A fine example of this was the Antidote restaurant formerly based in the Hotel Alliey in Monetier-les-Bains, and now moved to a new location at the Fantin Latour in Grenoble. 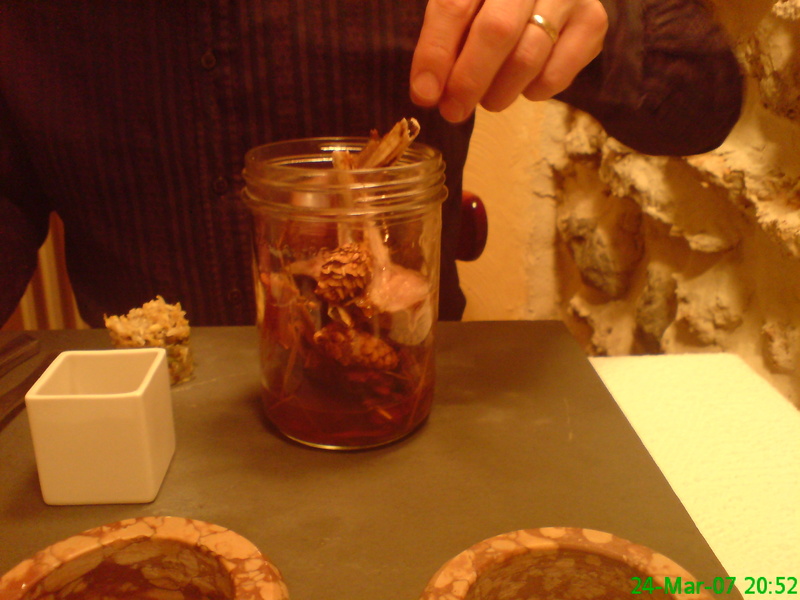 His use of the local produce, and mountain surroundings produced some innovative dishes, such as Mountain Lamb baked with Larch, and served in a jar (the aroma of the larch complemented the lamb perfectly). The restaurant now has a new chef and is continuing the tradition of food with a local influence, accompanied by fine wines from the cellars. The traditional cuisine includes cheeses, from goats, cows and sheep, and locally cured hams, and the famous Agneau de Sisteron, from sheep grazed on wild herbs from the high slopes in the summer, giving the meat a wonderful flavour. The Champsaur, between Grenoble and Gap, has its own delicious speciality, Les Tourtons, a small ravioli-shaped pastry filled with both sweet and savoury fillings. The savoury versions include fillings if spinach, cheese and onions, and potato and goats cheese, and are often served with a salad with mountain ham. Raviole de Brouquetons, are croquettes of potato an cheese, served with a green salad, and accompanied , rather unusually, with honey, or confiture de myrtille (myrtille is a small blueberry). Oreilles d’Ane (Donkeys Ears), may alarm those not familiar with the region, but they are suitable for vegetarians (ask them to be served without the thickly sliced ham), being simply a baked dish of pancakes, layered with cheese , béchamel sauce and spinach. The donkey’s ear comes from the shape of the wild spinach leaf. Fresh fish from the rivers features on many of the restaurant menus, and is often caught from the river flowing nearby. Trout farms are common, and you can call in and buy your own for dinner. You can have the fish on the plate within 20 minutes of it being caught. 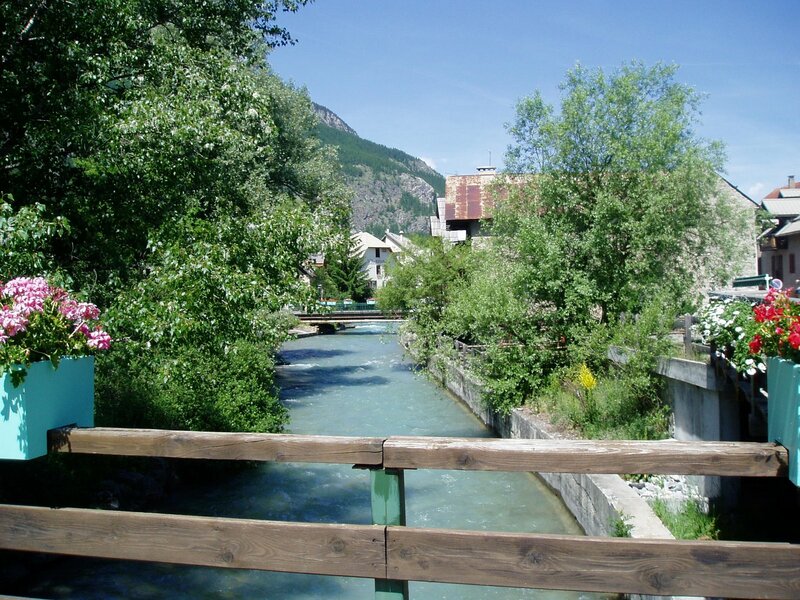 The wines of the Haute-Alpes are from the vineyards along side the River Guisane between Gap and Sisteron, where winding roads pass through orchards of peaches and apples as well as fields of vines. Although classified only as a vin de table, it is a decent quality every day wine, with a good fruity flavour. It is available locally for around 5€ a bottle. Our End of Season trip. So, setting off from home to East Midlands aiport yesterday, we spotted our first snow around Sheffield, we normally have to wait until we reach the Alps. Uneventful flight, and picked up the car. To quote the car hire desk, “no snow on the roads, none forecast, here’s an automatic Astra). Loaded up. To the guys trying to cram themselves into the Peugeot 807 next to us, I hope you got sorted. 7 people, plus luggage and a couple of ski and board bags were not going to fit. And they were going to Morzine, which apparently had no snow. Once past Grenoble, the weather changed, and rain gradually turned to snow once we passed La Grave, as we climbed the Col du Lauteret. Visibility got worse, and there was snow on the road. Fortunately this automatic had a snow and ice setting, and we made it down to Monetier in one piece. Snow had stopped this morning, and the pistes looked to be more like January than April. A quick breakfast, skis waxed, and we were up there for 9.30 . The first few runs were brilliant, empty slopes, and unpisted runs. Amazing that it is the 18th April. Very bad visibility on Yret though forced us down from the top before lunch, and the lower slopes were rather heavy and churned up. Looks like there is more forecast for tomorrow.